Serengeti Game Ranch just north of Comfort, TX is offering white-tailed deer hunting, elk hunting, and exotic game hunting. This Texas Hill Country ranch has also been established as a private bird hunting preserve allowing us to provide upland game bird hunting that includes quail, pheasant and chukar. Our goal is to give our hunters an exciting, top-quality hunt all at a price they can afford. We are located in the Texas Hill Country halfway between Comfort, TX and Fredericksburg, TX. The Serengeti Game Ranch is conveniently located only about an hour from San Antonio, TX or Austin, TX. At Serengeti Game Ranch, owner Jim Bruner has drawn on his thirty-five years of experience to integrate a wildlife management program that includes superior native whitetail deer, ten species of African plains game including Kudu, Impala, Blesbok, Red Lechwe, Grant’s Zebra, Waterbuck, Scimitar Horned Oryx, Wildebeest, and a first class Upland Bird Hunting program featuring Bobwhite Quail, Ring-neck Pheasants and Chukar. Serengeti Game Ranch has an outstanding herd of Scimitar-horned oryx, Addax, and Dama Gazelle. We will, from time to time, remove animals from the herd as necessitated by proper herd animal husbandry management. If you would be interested in assisting Serengeti Game Ranch promote the survival of the three species feel free to contact us at your convenience. 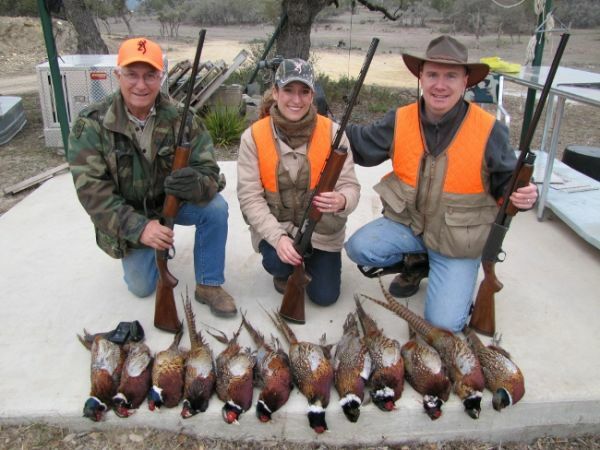 Axis Deer Serengeti Game Ranch is a Texas Parks and Wildlife licensed private bird hunting preserve so there are no limits on the numbers of quail, pheasant, or chukar you can harvest. We have our standard upland game bird hunts, however we can customize a hunt to fit your individual needs. In addition, we offer corporate hunt packages which can also be tailored to fit your specific corporate need. Rocky Mountain ElkJim and Kim Bruner invite you to come visit their Texas Hill Country game ranch and give us the opportunity to share with you a beautiful piece of the Texas Hill Country while providing you with a pleasurable hunting experience in a relaxed atmosphere.